As the fashion trends advance today, heels are getting higher and higher. Popular podiatrists like to call this trend shoe-inside, as this popular fashion trend can lead to anything from ankle sprains and injuries, to chronic pain and permanent damage to your feet and lower limbs. Unfortunately, ladies still desire the elegance and class of a high heel and, we are slaves to fashion, no matter how much we try to hide it. Well, the good news is, you can have both, you can keep your style, and keep your feet happy, by investing in a gorgeous pair of block heeled shoes. Switching to a lower and more solid heel take extensive pressure off your feet, and prevents damage to your metatarsal bones and tendons. A lower heel creates a much more natural position for your feet in general, which is much healthier and safer in the long run. A chunky block heel will create more surface area so that your weight can be distributed evenly, resulting in much better stability, when compared to a stiletto or spindle heel. Although a thicker or block heel that is a bit higher still places some stress on the ball of your feet, your tripping hazard from instability is minimized and the pressure is much, much less. When it comes to high heels, particularly stilettos and spindle heels, I cannot begin to stress enough how dangerous they are and how bad they are for your feet, knees, ankles, back, and hips. The pressure a high or even mid-sized heel exerts on your feet can lead to blisters, swelling, Bursitis, swelling, and even Achilles Tendinitis. An Ultra High heel forces your feet into a position placing extensive stress on the ball of the foot, which in turn can cause severe inflammation in the delicate sesamoid bones which branch from your metatarsal bones in your feet. This chronic stress can even lead to a hairline fracture of these delicate bones and structures in your feet. Besides the damage high heels cause, they greatly increase your risk of falling, spraining your ankle, and even sustaining other injuries. Sandals are cool and comfortable for summer. You can get a dress sandal or casual sandal with a block heel for all occasions. A Block heel can be different heights according to your style preference. The lower the heel, the safer and more healthy for your feet. A Block heel reduces pressure on the balls of your feet and prevents tripping and ankle spraining. Block heel sandals are available in a large range of styles. The Block heel sandal may come with some other comfort features such as a cushioned footbed or arch support. A block heel improves stability and is much easier to walk with. One of the latest fashion sandals is the lace-up sandal, such as this beauty from Rampage. The Emmie is available in a large number of color options for your perusal and has a soft suede leather feel upper construction with a mid-sized block heel, ideal for all occasions. Features soft textile suede leather feel uppers with an adjustable lacing system. A sturdy medium height block heel. Stunning peep toe design that is elegant for all occasions. The sole is durable and synthetic. Platform style at 1.25 inches. For comfort, I would most definitely recommend the City Classifieds Gladiator-style sandal. A fashionable Gladiator sandal, with adjustable straps and buckle details, as well as a cushioned and padded comfortable footbed. Available in smooth black leather, beige nubuck leather, smooth tan leather, and salmon nubuck leather options. Smooth and soft leather uppers with buckle detail and adjustable straps. A short block heel that is sturdy and durable. The insole is lightly padded and cushioned for comfort and support. There are cored ladder straps on the vamp. I simply love these Gladiator sandals from Guilty Shoes, they are available in a huge range of different styles and colors. You can choose anything from a White with lace uppers, to tan with smooth leather uppers, Nubuck uppers, and many more with lovely designs and different cutout forms. 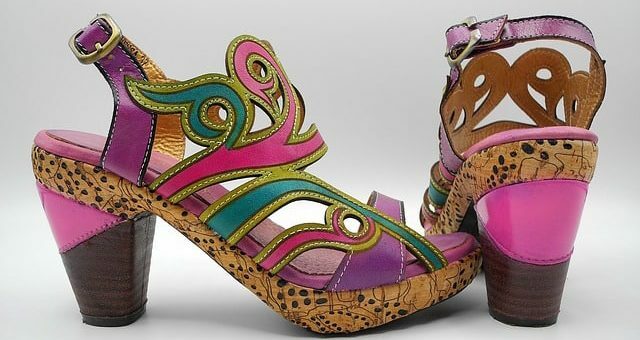 Every sandal comes with a stiletto type block heel and platform, and an adjustable ankle strap. Ideal for more formal occasions and an evening out. Available in a large variety of designs and color options each with the signature platform, block heel, and ankle strap, in a Gladiator style. Synthetic and suede materials that you can choose from for the uppers. A comfortable, cushioned insole and a better fit to keep your feet snug and secure. Perfect for parties, weddings and many other special occasions. Who knew that you could get a pair of Crocs in a Block Heel Sandal. Well, we all know how soft, squishy and comfortable a pair of Crocs can be, so why not give these stylish and fashionable sandals a go. They are perfect for casual excursions and shopping sprees, with the added bonus of being super soft and comfortable on your feet. Features the super soft, comfortable and lightweight Croslite material. A V-shaped block heel and cutout design. Cool and comfortable for summer with an easy slip-on fit. Durable with a synthetic patterned sole for slip resistance, and elastic gore for a more flexible fit. Clean cut, classy, and elegant, that is all I have to say about the Soda Topshoeave women’s Chunky Heel, ankle strap shoes, what more do you need for sophisticated style. A Faux Leather upper construction with adjustable Velcro back strap and open design to be more cool and comfortable. Available in many bright and neutral color options for you to choose from. A stacked chunky heel with medium height. The footbed is lightly cushioned offering soft and gentle support and comfort. A Vamp and ankle strap with a hook and loop closure. The sole is manufactured from PU Nubuck. Something simple and comfortable, the Dream Pairs Low-Chunky Heel Pump Sandal features an open and chic design and is available in many colors and prints for you to choose from. The Uppers are manufactured from a variety of smooth, patent or Nubuck, synthetic leather styles, as well as some fabric styles. A low block heel and an open toe. There is a buckle closure at the ankle strap for a customized fit. The insole slightly cushioned for superior comfort and support. While every woman loves a stunning pair of high heels and owns at least one or more of these, they are not the safest, most comfortable or healthiest options in shoes for any occasion. For this reason, I am so happy to watch the latest Block heel fashion come into place and rising in popularity, as it solves most of these issues while still practically remaining a “heeled” shoe, for all intents and purposes. Elegant, fashionable and good for your feet, why not invest in a gorgeous pair of block-heeled sandals!